Available in 2, 4, 6 and 8 inch widths. 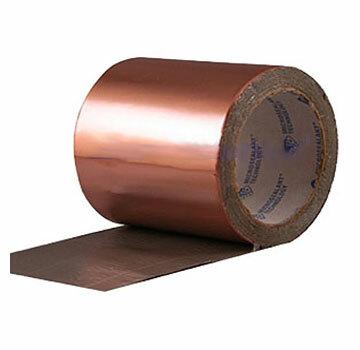 EternaBond CopperFlash leak repair tape has a heavy copper facing (requires no UV protection). The patented adhesive has an integrated primer which allows CopperFlash to BOND with the surface it is installed on. Perfect for re-seaming all roofs, regardless of the material, CopperFlash makes a permanent water-tight seal (except silicones). Also great for tank repairs. Sag rating of over 250 degrees F.